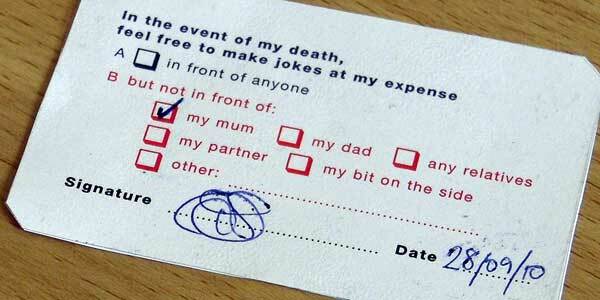 I want to help others to laugh in the event of my death. I've had an NHS organ donor card since I was 12. Hopefully it won't come into use for a long time, but it's good to know that — if the worst happens — my body might be useful for others. The card's battered and beaten, but I've had it for more than a decade. But let's say that, tomorrow, I die. Maybe it'll be in something relatively ordinary. Or maybe I'll ironically fall over a cliff while piloting the very invention that I own and promote — an invention that, just by itself, has comedy value. Let's be honest: that's quite funny. It's black humour, sure, but it's still humour. It's something that'd happen at the end of an episode of Father Ted. So how can you tell people that, if the worst happens, it's okay to make jokes? That if you can get comedy out of tragedy, you should go for it and never mind "respect for the dead"? Simple. 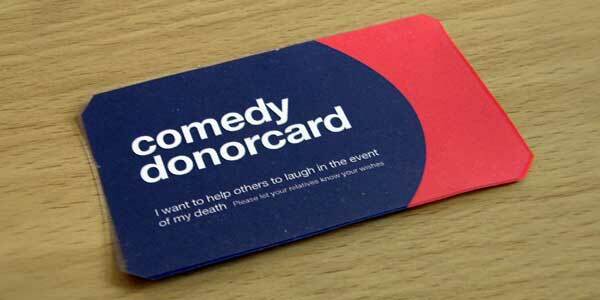 Presenting my new invention: the Comedy Donor Card. Print it out, sign it, pop it in one of those little credit-card pouches you get from stationers, and presto: those who survive your hilariously ironic death can laugh without guilt. Remember to let your relatives know your wishes. Here's a printable PDF with four cards. It's sized for A4 paper, and it should work in pretty much any printer. Let me know what you think by email or Twitter — I'm not sure if I've crossed a line with this. Oh, and you should sign up to the proper organ donor register too, whether you're in the UK, in the US, or somewhere else.